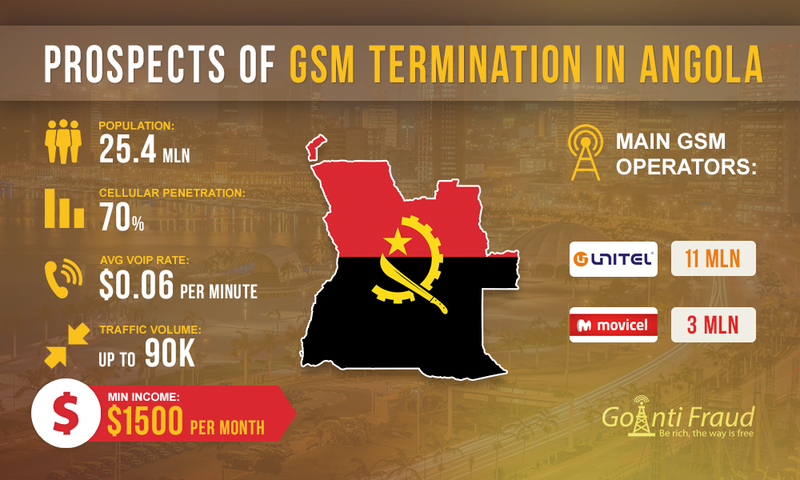 Angola, a South African country, is quite popular as a destination for VoIP GSM call termination. The country is actively engaged in the extraction and export of oil, due to what is the fastest growing in the continent among the countries of sub-Saharan Africa. On the discussion forums you can find a lot of offers from originator companies willing to buy routes for the international traffic in volumes up to 90,000 minutes per day. Average voip rates are $0.06 per minute. To choose the right package for forwarding calls at local rates, you can get a solid income doing voip termination in Angola. Angola has a population of about 25.4 million people, at the beginning of 2016. The level of mobile penetration in the country is about 70%. After the civil war was over in 2002, rather large foreign investments began to come here. To increase the attractiveness to foreign investors, the Angolan government has decided to develop local telecommunications market. This decision is also linked to the plans to diversify the economy of the country, where 80% of the revenues come from mining and export of offshore oil. Developing the telecommunications market, the government plans to improve the business climate in the area of e-commerce. More than 70% of the local population live below the poverty line and have an income of $2 per day, which causes migration of residents in other countries. Due to this and through foreign investment, the inflow of international voice traffic comes to the country. To date, the country has two main operators providing GSM services - Movicel and Unitel. They occupy leading positions on the market. It is believed that these companies have established a "duopoly". In the near future the situation should change somewhat, due to changes in the mode of state licensing of mobile operators. It is expected that new players will soon appear on the market in the mobile sector. Currently, Unitel services are used by over 11 million people in Angola, while the subscriber base of Movicel covers about 3 million users. Operators offer a variety of prepaid packages. Among them you can find the tariff plans, which will cost $0.013 for a minute of a local call. Accordingly, in Angola you can make $1,500 doing termination with gsm voip gateways if you have an 8-channel device operating 5 hours a day). You can terminate efficiently by connecting the EjoinTech equipment to GoAntiFraud. We provide a complete solution to make GSM termination profitable, thanks to which you will increase the profitability of the business. EjoinTech is our direct partner so you can buy the gateways of this manufacturer at a low price.